Looking for where to stay in Seattle? 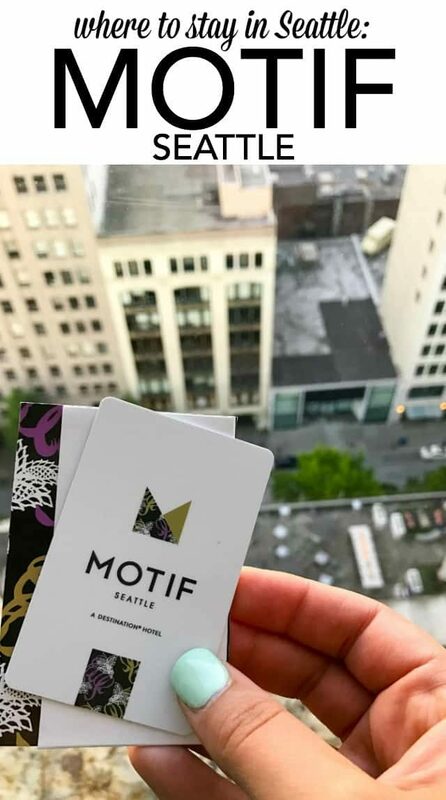 The Motif Seattle is one of the best hotels in the Emerald City! Great location, beautiful rooms, great service, and it has a fabulous restaurant too! Last weekend my family and I took a short trip to Seattle, Washington. We wanted to get away for a few nights to celebrate my husband’s birthday and the flights to Seattle were affordable that weekend. Then I just had to find a good place to stay for the three of us. It’s always challenging to find hotel rooms when you have kids. 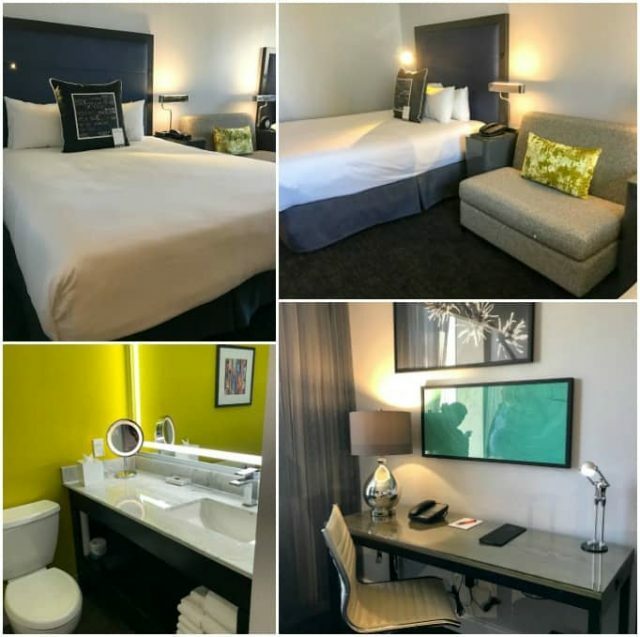 We usually stay in suite hotels, but those are often hard to find in downtown city areas where we like to stay. (I like being in the middle of everything when I travel.) If we don’t have a suite we definitely want a big room that will accommodate us without feeling claustrophobic. I searched through dozens of downtown Seattle hotels and knew I had the perfect match when I found the Motif Seattle. Motif Seattle is located downtown, right in the middle of everything there is to see in Seattle. 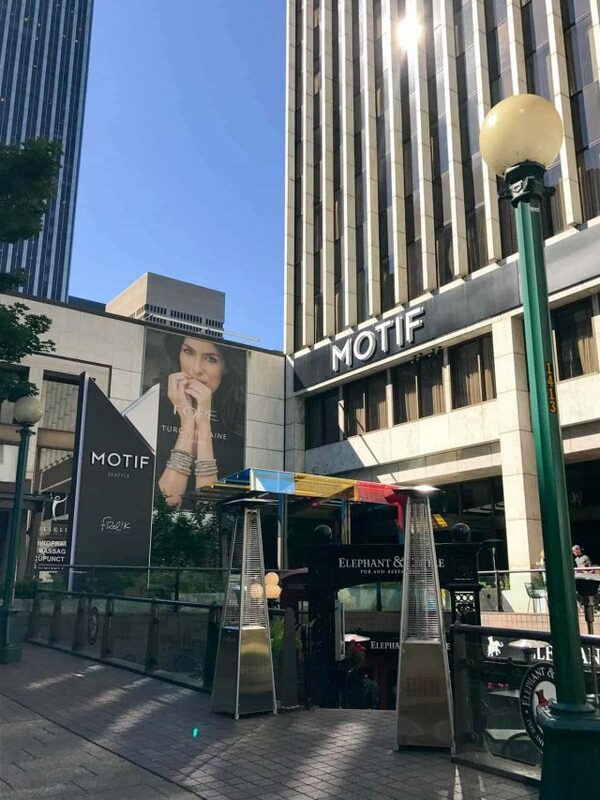 The hotel is on 5th Avenue, just steps from Westlake Center and the monorail stop. Just a few short blocks away is Pike Place Market and in between are numerous restaurants and shops. The hotel is very walkable to almost everything you want to see in the Emerald City. We didn’t need a car and took an Uber anywhere to far to walk. Check-in is easy and painless and the staff is friendly and very helpful. They even have wine tasting at check-in time! And if you happen to arrive earlier than noon and your room is ready you can check in early for a small fee. The king rooms feature a king size bed and a pull out L-couch, with plenty of space to move around, and the suites have separate living and sleeping spaces. I absolutely loved how the bathroom counter had plenty of room. Often in city hotel rooms there is no place to put your toiletries, and with three people we needed as much room as we could get. The desk space was also ample for working. The best part of the hotel room, though, was the view. The rooms at Motif either have a view of the Emerald City Skyline or the waterfront. We had a water view and it was breathtaking. Every night we sat on our beds and watch the sunset. We are a water-loving family who are land-locked where we live. Going to a city where we can see the water all day? Priceless. In addition to the comfortable beds, gorgeous view, and urban decor, the room also offered some of the comforts of home. 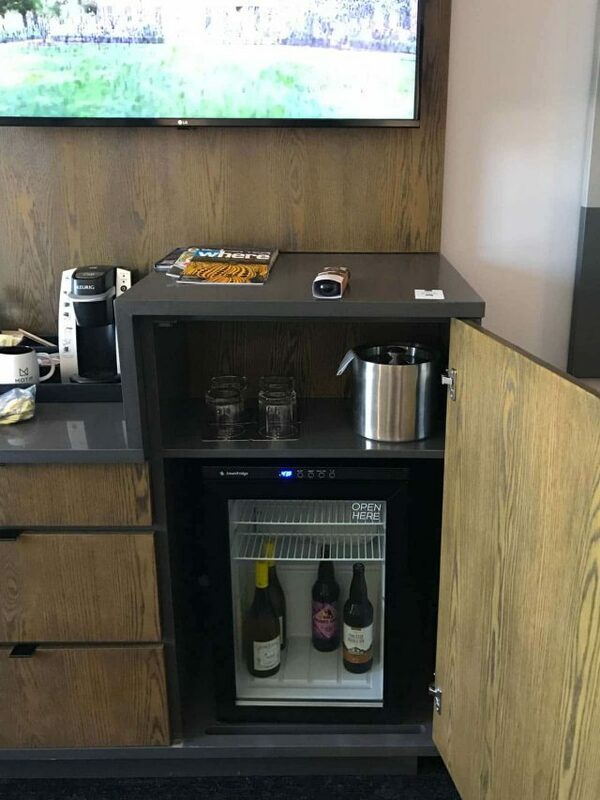 Each room has a refrigerator, perfect for traveling with a family. There is a Walgreens and a Target within just a few blocks, which makes it easy to stock up on wine or waters and snacks. I even bought orange juice for Jordan in the mornings, something she loves to drink to start her day. If nothing else, Seattle knows it’s coffee. 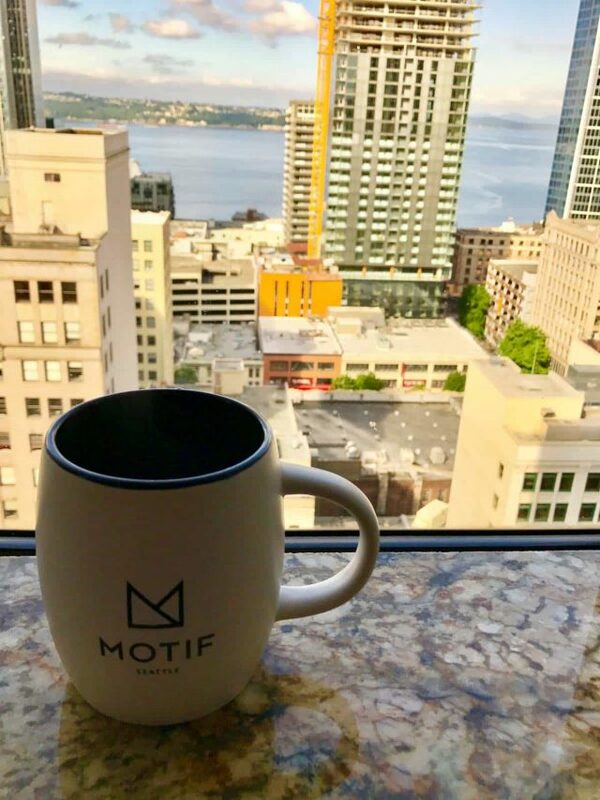 There’s no boring hotel coffee at the Motif; they have a real Keurig that brews real K-cups, and they provide complimentary Starbucks k-cups with real coffee mugs and real creamer. I always travel with Via travel packs because I normally can’t stand hotel coffee, but the Motif has done it right. You can trust they’ll have good caffeine for you to wake up with. They even provide 2 complimentary bottles of water each night. The restaurant hotel, Frolik Kitchen + Cocktails was fabulous as well. We ate there for dinner, breakfast, and drinks and enjoyed every sip and bite. I’ll be posting about the restaurant soon! In the meantime, be sure to check out one of the recipes inspired by our stay: Pink Rosé Lemonade. Our stay at the Motif was truly magical. 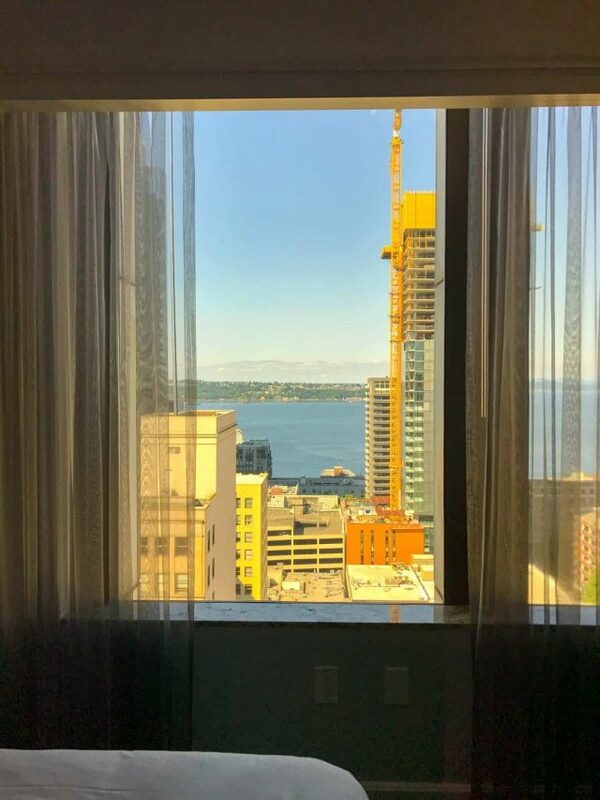 I loved every minute of being in the hotel room and I guarantee that when I return to Seattle they will be the first hotel I check for reservations. I still can’t get over the view. I’d never get tired of that! Motif Seattle gave me a combination media rate/comped stay to write abut the hotel. All opinions are 100% my own. I truly loved my experience at this hotel! Pin to Win a Kitchenaid Mixer! What a nice hotel and I agree that suites, or at least ample space so you’re not on top of each other, makes for a much better vacay! I love Seattle, and when we go back there I want to try that hotel. It sounds perfect for tourists! Ya, last month I visited Seattle and really it was a nice journey. Although, i didn’t stay on Motif hotel but next time visit i will consider that hotel. Hotel rooms are attractive.